Paul Buker had worked at The Oregonian for 36 years. Now, on the afternoon of August 30th, 2013, he was waiting to be laid off. Buker is a newspaper man in the best connotative sense. Smart, biting, contrarian, and funny — a good storyteller with a tired air of “been there, done that” that you can only portray when you very well have have been there and done that. With a helmet of wavy dark hair, the giveaway that Buker has recently shorn a number of the pounds associated with eating press-box food for his entire adult life is in his well fleshed out face. Buker got his first job writing in his hometown of Twin Falls, Idaho in 1968, when the town population sat around 20,000. From there, Buker worked his way up. The Oregon Daily Emerald, the Eugene Register-Guard, sports editor of the Idaho Press Tribune, and then The Oregonian, Oregon’s biggest and most prestigious newspaper printed in the heart of the state’s biggest city, in 1977. Buker settled in Portland, and made his mark. Over his 36 years, Buker covered everything in sports from college football and basketball to professional bowling and figure skating. He covered the Blazers, he covered the Timbers, he covered Oregon State, and he was good — five times, Buker was named Oregon sportswriter of the year. This guy was part of the fabric of his newspaper, and his city. Not anymore. Since being let go last summer, Buker has not found full-time work. He has done some freelancing, and had a job offer in Eugene that would have required moving away from his family and uprooting his wife from her life and work, but opportunities are thin. “Its hard to be a 60 year old guy looking for a new job if you’ve only been a newspaper writer for your entire life,” Buker tells me. In a way, Buker says, his layoff did not hurt as much it could have. As the newspaper industry loses more and more money and prestige, and turns its attention towards page clicks and cost cutting and social media, Buker does not need to scramble for a new career. Buker’s self-esteem has suffered, but financially, he will be fine. Meanwhile, Buker’s old colleagues at “The O,” as he calls it, are left trying to cope with standards that call for three articles per day, or 40% more stories per year, an engaged social media presence, 140 character stories, and an emphasis on slideshows and soundbites — and things are only going to get worse. Buker could feel the walls caving in long before that August 30th. “When they announced that there would be some layoffs a few summers ago, I kind of thought I might be high on the list to be let go because of my age and I had one of the higher salaries… A lot of my coworkers were shocked, but I really wasn’t.” When Buker talks about his layoff, it is not so much his shoulders that sink as his voice. He speaks in fits and starts, huffs and puffs. It still hurts, being let go, in a dull, confusing way. In the summer of 2013, The Oregonian began a dramatic attempt to rescue what was clearly a failing business model. In the face of rapidly declining income and fighting a losing battle in the face of the internet and a 24-hour news cycle that has destroyed the majority of newspapers as we know them, the paper decided to cut back to publishing three days a week, focusing their resources on their website OregonLive.com, and laying off in excess of 95 staff members (Mesh). The paper had been trying to stem the tide since the middle of the last decade. “The first sign of problems was when they had everybody take a pay cut a few years ago,” Buker says. “Management took a 15% pay cut, and writers like me took a 10% pay cut. One of the biggest things was Craigslist taking away the classified section of the Oregonian. The paper used to be a real cash cow and had a pretty big profit margin. The revenue went down. The next step were furlough days — they told you you were taking mandatory days off.” On June 21st, 2013, employees began finding out they’d been released. Buker was among the first to be notified. “The editor said, ‘could we talk a minute,’ and I knew what was coming” (Buker). There was no drama. Just a cold, hard, surreal finality. “At some papers, it’s kind of an emotional scene — employees get called in, and they come out holding their severance package in tears,” Buker says, “It’s like walking the green mile.” Buker had two months of vacation time accumulated. The company was giving it to him. His last day would be August 30th, and that story is sad enough. A proven reporter gets jettisoned after almost four decades of quality service, along with many other journalists and personnel who do not deserve to be out of work and who we cannot afford to not have working. But what those people left behind is arguably just as troubling: An industry that is, over the next however many years, literally stopping the presses. The Oregonian is moving. After more than six decades in their iconic location across the street from Providence Park, The Oregonian Building at 1320 S.W. Broadway is being sold to an Urban Renaissance Group, a Seattle real estate firm. Quite simply, when The Oregonian laid off a quarter of their staff last year, and with less and less journalists even going into the newsroom each day, there was too much space. So the paper is slinking away to a new, smaller location. It will be built, according to the Oregonian’s own story on their move, with “a focus on journalism and sales in a digital age” (Njus). When journalism and sales are paired as equal focuses of a newsroom with an emphasis on the digital age, it is easy to wonder if a newspaper is committed to publishing the best and most pertinent product possible. Physically, the newspaper is moving. Philosophically, it is changing as well — alarmingly so for many in the news industry. In March, new publishing standards mandated by the Oregonian’s management were exposed by the Willamette Week. Among the new policies: In an effort to increase web traffic by 27.7% by the end of the year, the paper mandated that, “as much as 75 percent of reporters’ job performance will be based on measurable web-based metrics, including how often they post to Oregonlive.com” (Mesh). Reporters would be expected to post at least three times per day, increasing their total story production by 40% over the entire year (Mesh). Writers would be expected to write comments on their own stories in order to stir up debate in the comments section of OregonLive, where the majority of stories would be posted before they were printed in the physical paper (Mesh). There would be merit pay for writers who exceeded their publishing goals (Mesh). But here’s the funny thing. Even though he’s been thrown out by the industry and seen the same fate befall friends, Buker will not give up on journalism. “I still think journalism is a great career. If you are really really good, there is still room for you” (Buker). Journalists who have been disavowed by journalism refuse to disavow journalism even though they have every reason to. In the news industry, there is a divide. One on hand, many people think journalism as we knew it is dying. The argument is that these days, people have shorter attention spans, multimedia at their fingertips, and everyone has a blog. In an effort to find niches and stay relevant — and most of all, stay profitable — news has become more partisan and more skewed, “gotcha” journalism has been elevated to normal journalism, and we appear headed to a place where the news is reported in 140 characters. By its very nature of being published every morning, newspapers are outdated immediately in our 24-hour news cycle. More philosophically, the world is getting faster and faster. Sitting down with the newspaper and a cup of coffee in the morning is an outdated, if romantic, image for many. That’s not to mention the legions of people in the print news industry who have lost their jobs — including, of course, Buker. Reasons to be cynical are not hard to find. But there is another line of thinking, one that says this could very well be a golden age for journalism. With people more interconnected than ever, by social media and the internet, good stories and news are more accessible than ever. If you are, “really really good,” as Buker puts it, or have a really, really good product, chances are that product will come to the forefronts. That has not always been the case. Entrepreneurial websites that have found specialized niches like FiveThirtyEight, Grantland, and Politico have all been wildly successful. People are no longer mainly reliant on newspapers for their news, and so there is a greater diversity, quantity, and very possibly quality, in reporting. If journalism and reporting are failing industries, how is it that many people more informed about the issues they want to know about than ever before? Therese Bottomly pushes back on the idea that modern journalism is a place to flee. She is the Director Of State Content at The Oregonian, where she oversees the paper’s coverage of politics, government, sports, investigative reporting, business reporting, and environmental reporting. She sits on the board for the Oregon Newspapers Publishers Association, and the board of the University of Oregon Journalism School, and it becomes clear in after about five minutes of talking to her that Director Of State Content really means Managing Editor with Gusto. Bottomly believes in what she is talking about, and like many people who believe in what they are talking about, Bottomly is a compelling interview. Bottomly is one of the few Oregonian employees who still comes into the office every day at the newspaper’s new location, the top floor of a downtown building with sleek glass doors, and from the lack of items lying around, a number of reporters who have not yet or never will move in. From behind her desk each day, Bottomly is still advocating journalism. Not only its old-fashioned honor, but also its long-term viability. “Print newspapers may not be a place to have a lifelong career like I had, but the web has even a greater need for reporting and news content” (Bottomly). Bottomly assured me although “the printed Oregonian is smaller,” the quality of reporting is still the same — she pointed out that statistically, the number of reporters on staff at the Oregonian is the same as before the paper was rebranding as the Oregonian Media Group a year and a half ago and laid off 25% of its staff. “You will probably continue to see newspapers cut back… but you will never see no newspapers” (Bottomly). It is easy to see why Bottomly’s job is intoxicating. When I knock on her door, Bottomly is taking a call consisting of a woman screaming down the phone-line about The Oregonian’s master plan to manipulate voters into voting against marijuana legalization by running an “Ask Amy” column about a dad addicted to pot four days before election day. Bottomly’s cold response that the “Ask Amy” column is syndicated by the Chicago Tribune clearly shakes the caller’s confidence in her claims, but she is able to recover her verve with the newfound accusation that the Chicago Tribune is, in fact, running The Oregonian. Bottomly’s cursory, “I have a ten o’clock,” ends the call. “You come in every day and you don’t know what’s going to happen,” she says. Bottomly’s quick smile, which fits her face like a glove betrays her eagerness, which is part thoughtfulness and part zeal. She often leans forward in her chair – in other words, she leans into a good question. Bottomly’s eyes light up as she looks forward to election day (she told me that John Kitzhaber and Jeff Merkley would win easily, and that marijuana legalization would come down to young people voting late), and by the time she launched into a story about the Al Gore vs. George Bush 2000 Presidential election, she was gone for the next ten minutes, reliving the rush of being in the eye of a major story. Paul Buker was a watchdog. Obviously the world was not a safer place because Buker was covering sports, but there was a comforting knowledge when Buker was at The Oregonian that he was one person who had found his place in the world. Buker tells a story about covering Portland State football in the 1990s, when the Vikings made the division two national championship game which was being played in Huntsville, Alabama. The night before the game, Buker had gone out drinking with a group of people from Huntsville and Portland State support staff, and after a few hours at the bar, Buker started to worry about how he could safely drive his rental car back to his hotel. Just as he was getting up to leave and wondering aloud what he should do, he felt a hand on his shoulder. “Don’t worry about it,” the man said. Then Buker realized — “It was the Huntsville Chief of Police I’d been drinking with all night” (Sprague). That is the kind of reporter The Oregonian lost, and so while listening to Bottomly talk, it is important to understand that her connection to The Oregonian is like that of a twelve year old boy in Boston to the Red Sox. Bottomly was hired as an intern on the copy-editing desk straight out of the University of Oregon in 1983 as The Oregonian was merging with the Oregon Journal. By 1998 she had risen to editor, and when asked if she could see herself in the same office for the rest of her career she says, “I’ll be here as long as they’ll have me.” Quite simply, I have come to her office early on Halloween morning to ask her if her paper is sacrificing its morals for page hits and if her profession is on its deathbed, and upon my arrival, it is easy to see that where the Oregonian’s focus is. Bottomly’s beautiful new corner office has two massive computer screens — and one is tracking the traffic on OregonLive.com, spitting out real-time numbers on who is reading what and when. She says the numbers give the paper a better idea of how to reach its readership. Of course, when the paper was only in print, “there was no way to see what people were reading.” The paper has recently discovered that the majority of its readership on weekends come from mobile phones, where people are less likely to read long articles. That is why the paper has shifted away from publishing its most in-depth profiles and investigative stories on Sundays. There is change all over The Oregonian, which is still adjusting to its new facility — a broad, spacious top floor of the Crown Plaza building on First Street in downtown Portland. There are cubicles, conference rooms, outer offices, and a receptionist on the ground floor of the building who chuckles to himself with every instruction he gives. It is not hard to imagine that floor space teeming with reporters, all with somewhere to go, all with something to do. This is just a slow, Friday morning, though, and just a few papers are strewn around the newsroom. They look different these days, the physical newspapers. They are much longer and thinner, and fold out like a magazine. In newspaper terminology, the size of the paper has changed from a “broadsheet” to, ironically enough considering the paper’s new emphasis on slideshows and gossip, a “tabloid” (Redden). 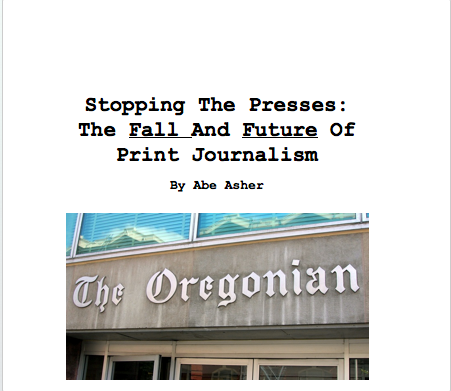 Over the next hour, a thoughtful Bottomly combats the narrative that The Oregonian is falling apart. The job is not harder now, she says, it’s different. On expectations that reporters post 40% more stories: “Reporters are asked to iterate. You used to write your story, and turn it into the editor at the end of the day for print. Now, you’re expected to write every tidbit and post more information as you get it.” On reporters complaining: “It’s a hard change for reporters… they feel like they want the story to be complete when they put it up.” On the Willamette Week reporting that reporters’ pay would hinge on page hits: “Really what it is about is that reporters make a base salary. Then if the company meets its financial goals, there could be bonuses.” More on the bonuses: “Page hits are only one part of the criteria for bonuses, and that the bonuses would only be two percent of a reporter’s salary at maximum.” I liked Bottomly. I found her to be warm, generous, and easy to talk to. She is a Timbers fan, a dedicated worker, and a mother. She is not the bad guy. She’s just selling The Oregonian. It is her job, and she is good at it. The problem is, fewer and fewer people are buying. The product has suffered. When Bottomly says that the number of reporters is the same is it used to be, she does not mention that experienced, talented, higher-paid journalists like Buker were released and replaced with younger, part-time, lower-paid journalists who have frequently been hired straight of college and thrust into jobs once occupied by people with years of experience. It is not a good look for The Oregonian. The issue is not so much that the paper is not on paper anymore. It’s not the medium that is the problem. As Bottomly says, the company is trying to reach people, “where we think they will be, not where we think they ought to be.” The issue is that the quality is suffering at the hands of the bottom line. There is no question that the newspaper’s influence is all but gone. The Oregonian stopped delivering to Eastern Oregon and the Southern Oregon Coast in 2006, and in 2008 stopped delivering in all areas south of Albany (Eugene Register-Guard). They stopped delivering three days a week anywhere in 2013, and the general public discourse around the newspaper has become negative at best, and dismissive at worst. Buker says that if you are really, really good, there is still room for you in journalism. But was Buker not really really good? Was he not the quintessential newspaper reporter, the guy who somehow filed his story on deadline one late night in Tempe, Arizona after a frazzled Arizona State beat writer in a narrow press box had accidentally knocked him into his old, sensitive, teleram machine — a computer-like device that predated the laptop — and blipped his story away. “I sat there and tried to reconstruct everything I’d written, and I’ll be damned if the same writer didn’t come back from the other direction and blip my story again. I called The Oregonian said, ‘I’ve lost two stories, but don’t worry, I’ll write it again” (Sprague). Buker confirmed that the paper, “asked for shorter stories,” and “newsy” material to post on OregonLive even before he was laid off last year. Since his layoff, The Oregonian has began publishing “stories” that are just slideshows (Buker). Journalism is a great profession. Everyone agrees on that. But these days, it is terrible career. Pay has stagnated. The average salary for a print journalist is $36,834, and pay has not risen with general cost of living increases over the last decade (PayScale). If you are really, really good, chances are you will end up leaving journalism and appearing on television or the radio as many journalists have over the last decade. That is where the money is and the bigger audiences are. As we entrench ourselves further and further in technology and an interconnected world where news is readily and easily available, the role of journalists will become more important than ever before. There is a difference between professional journalists and citizen journalists, between crowdsourcing and reporting, and between people who can spout whatever they want to on social media and the internet and people who have to be counted on be accountable when it is necessary to be fast, to be right, and to be sure. We might be witnessing the death of journalism, or the golden age of journalism, or something in between, but this is for sure: We are in a critical age for journalism and its future place in our world. In his book Rebuilding the News: Metropolitan Journalism in the Digital Age, Philadelphia journalist C.W. Anderson writes about a fear that, “the journey to a new world of news will … fail before it even really begins” (Anderson 3). Newspapers, who are obviously and more and more boldly struggling for the money they need to survive, also need to regain the trust of the people they are trying to reach by valuing journalists and doing journalism. There is no way to know whether the newspaper industry will successfully navigate the next decade and beyond. But if the newspaper and news industry is unsuccessful, there will be a dangerous and uncomfortable dynamic in this country in times of real journalistic need. Election day was four days after I talked to Therese Bottomly, and out of everything she said, it was her offhand predictions that were sticking in my head. Bottomly said that Governor Kitzhaber and Senator Merkley would be reelected, and the marijuana bill would pass on the late support of young voters. Turns out, she knew exactly what she was talking about. Merkley and Kitzhaber were reelected, and marijuana was being legalized — outperforming its poll numbers because of a late surge of young people voting for the bill to legalize it. I realized that Bottomly and The Oregonian knew what was going to happen, just as they should, just as we want them to. No one else did, though. The newspaper was not delivered on Tuesday.